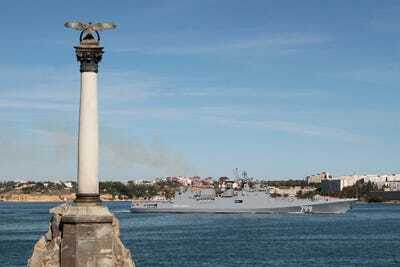 Russian Defence MinistryThe Russian guided-missile frigate Admiral Makarov arrives at the Bay of Sevastopol to join Russia’s Black Sea Fleet in Sevastopol, Crimea October 5, 2018. Russia deployed a new frigate armed with long-range Kalibr cruise missiles to the Mediterranean Sea, Reuters reported in early November, citing the Russian Defence Ministry. 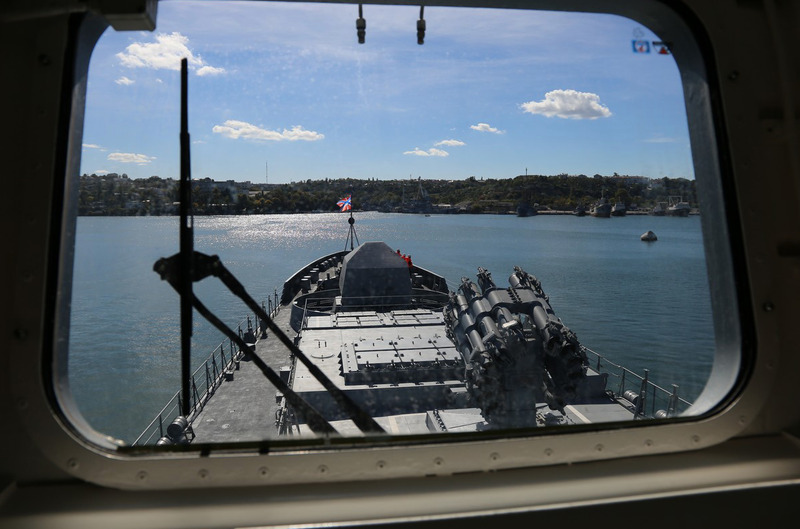 “The Black Sea Navy Fleet’s frigate Admiral Makarov left (Navy base) Sevastopol and laid a course for the Black Sea straits. The vessel will be acting in the standing naval force of the Russian fleet in the Mediterranean,” the defence ministry said in a statement, Reuters reported. Russia has previously fired cruise missiles from vessels in the Mediterranean at Syrian rebels in support of Bashar Assad’s regime. 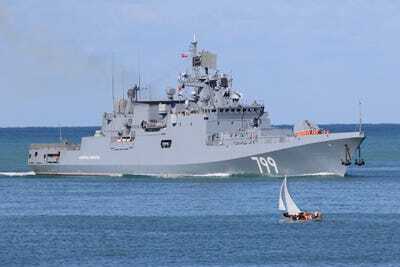 In August, Russia deployed its largest naval group to the Mediterranean Sea since 2015, including three other frigates, a missile corvette, a landing ship, two submarines, and more, Reuters reported, citing Russian media. Here’s what the Makarov can be armed with. 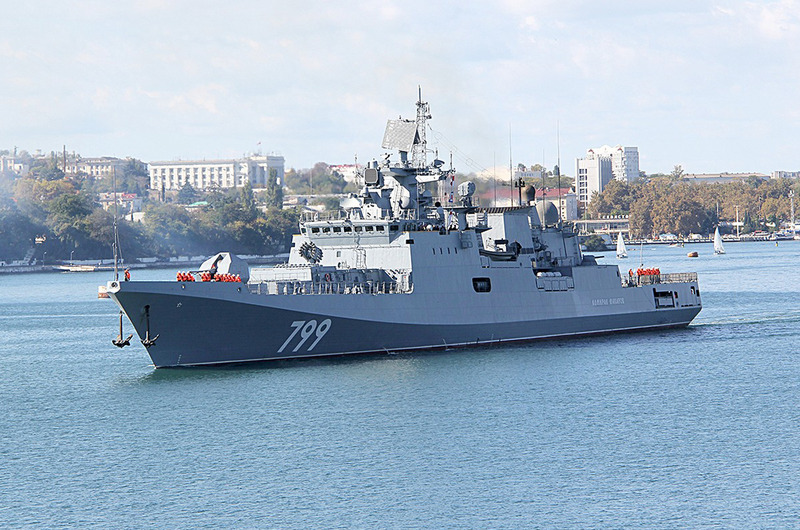 Commissioned in December 2017, the Admiral Makarov is an Admiral Grigorovich-class frigate, which are about 100 feet longer than an American football field and have stealthy hulls and superstructures that reduce radar, acoustic and infrared signatures. Russian Defence MinistryThe Makarov joins the Black Sea Fleet in the Sevastopol Bay in December 2017. Admiral Grigorovich-class frigates are heavily armed with a variety of missiles, torpedoes, guns, and rockets. Russian Defence MinistryThe Makarov in the Bay of Sevastopol joining Russia’s Black Sea Fleet on October 5, 2018. It has an eight-cell missile launcher that can fire long-range Kalibr-NK, or Club-N, cruise missiles. 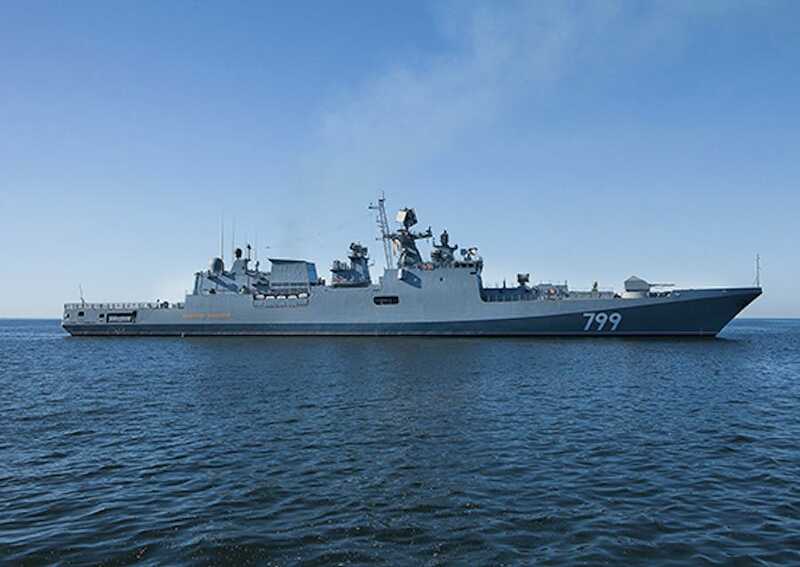 The ship is also equipped with a Shtil-1 medium-range air defence missile system, an Igla man-portable surface-to-air missile system and a Kashtan air defence close-in weapon system. It’s also armed with an A190E 100mm gun, seen at the front of the bow, an RBU-6000 anti-submarine rocket launcher and two DTA-53-11356 torpedo tubes. Russian Defence MinistryThe Makarov in the Baltic Sea during trials in November 2017. Here’s a shot looking onto the bow. You can see the A190E 100mm gun at the front of the bow, the eight-cell missile launcher in the middle and the circular RBU-6000 rocket launcher in back. Russian Defence MinistryA view of the Makarov’s bow and weapon systems.